Jon Torrey, a UVM Class of 2011 graduate, is giving a tour of Dealer.com’s Burlington headquarters, where he works as a digital advertising product manager for the leading-edge tech company. It’s a vast, open space with staff clustered in work pods and mini-conference rooms, brightly painted corridor “streets” named for Vermont towns, a regulation-size basketball court and gym, and a farm-to-table eatery called the Dot-Calm Café. The place has all the trappings of a Silicon Valley success story. It’s a truth also illustrated by the fact that the company—which creates web sites for car dealerships and helps them create strategic digital advertising plans using a variety of software products—was recently acquired for a second time, for $4.2 billion. Torrey says that “Dealer,” as it’s known around town, is representative of an emergent Burlington, a technology hub that might surprise outsiders. And he’s not alone in that estimate. The New York Times noted that the city has “lower unemployment than Silicon Valley, spawning a wave of technology pioneers.” Business Insider ranked Burlington as one of the “15 hottest American cities of the future,” and the city also made a Verizon list of the top ten most innovative metro areas in the nation. For college students attending local schools like UVM, Burlington’s growing prowess as a tech hub is very good news, Torrey says. The city’s thriving network of start-ups, growing mid-stage companies and, increasingly, big league firms like Dealer, offer a wealth of opportunities for students to explore internships during college and career-launching jobs after graduation. Torrey is a case in point. 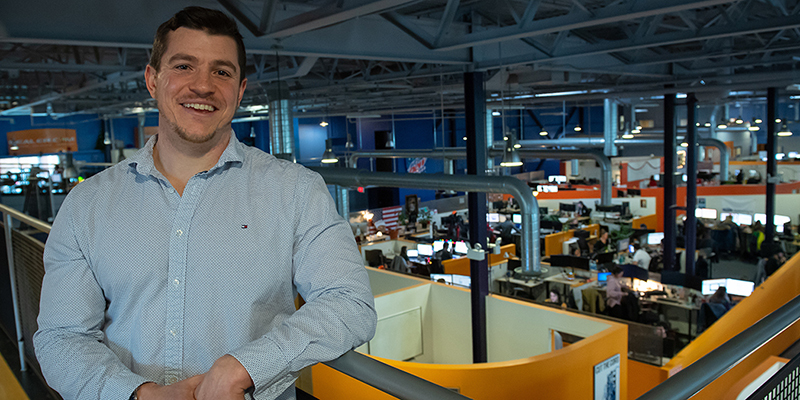 As a sophomore, the economics major landed internships first at the Vermont Center for Emerging Technologies, a tech incubator with an office on the UVM campus, then at Hear Forward, a small firm that developed online social advertising strategies for clients like Seventh Generation and Dealer.com, at that point a relative newcomer. Torrey and his colleagues were so successful at driving engagement and sales on Facebook for their clients – a relatively rare skill set at the time – Dealer.com bought the company. Torrey, who’d been hired by Hear Forward after graduation, suddenly found himself “on the rocket ship,” working at a company of 600 just beginning warp speed growth that would see employees more than double over the next five years. As Torrey’s career has quickly taken hold, he’s considered options to leave Vermont and relocate to some of the nation’s tech strongholds. But when he went looking, to his surprise his experience at Dealer left him unimpressed by the better-known firms. The emphasis the company put on health – with its gym and locally sourced food – was part of it. So was the intellectual challenge of the work. But it was the company’s culture that really set it apart. “The group of people who did it here, they had fun. They were a family; life is just a lot brighter when you’re around them,” he says. A job promotion at Dealer, coupled with all the things he loves about Burlington — four-season recreation to the food scene to a friendly network of young professionals — convinced Torrey to stay put. The success of Dealer.com has had a powerful ripple effect on the broader Burlington tech industry. In 2014, the company was acquired for the first time, for $1 billion, creating a windfall not only for Dealers’ five founders but for a large group of innovators who’d joined the company in its early days. While they could have gone anywhere, Dealer’s newly minted millionaires were as enamored of Burlington as Torrey was. They decided to stick around, founding new companies, joining existing ones and investing in others. With rapidly growing Dealer-linked companies like Fluency, E-Block, Social Sentinel, Widewail and Dealer Policy joining an anchor in Dealer and a host of other local tech firms, Burlington was becoming a tech mecca. That’s how Carly Caswell, 2018 UVM Grossman School of Business alumna, sees it. Caswell landed a job at Widget Brain, a Netherlands-based company that helps clients use artificial intelligence and machine learning to solve business problems. The company, which will double in size this year, chose to base its U.S. operation in Burlington.